We all know that chicken goes well with basically anything. But just to kick up a notch your chicken flavor, some aromatics are just better than others. 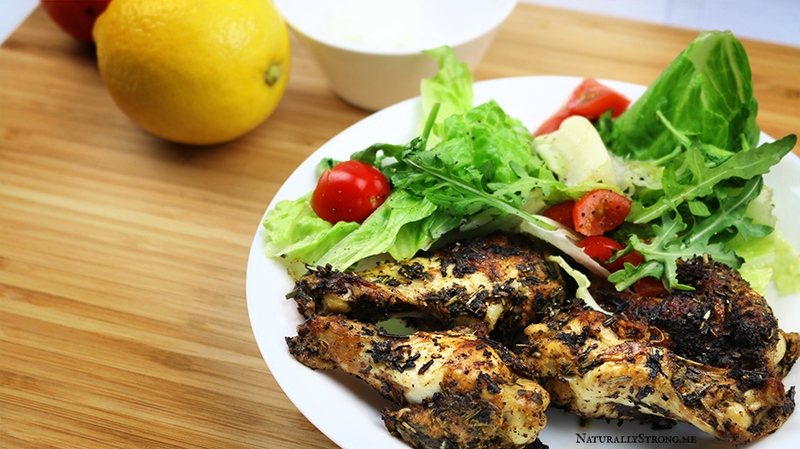 That’s why, in this keto recipe, I decided to bring the best herbs and aromatics to make this chicken taste incredibly delicious, without too much of a hassle. No carbs in this dish make it great for a ketogenic diet (especially if you are lifting and are on the ketogains macros!). Pair it with a salad and some crème fraîche for even more delicious taste! Chicken is the bodybuilders most favorite. Alright, alright, it’s chicken breast and this recipe is with chicken thighs. Well, I LOVE chicken thighs and can’t help myself coming up with recipes to make them taste even more delicious! Furthermore, as many of you, I like simple recipes: few ingredients, quick from pan to plate, little cleaning afterward. Guess what, this one-pot recipe is all of that! And it’s a keto recipe too! It uses mainly herbs that you should have in your kitchen available (if not, what are you even eating hahah) and other staple ingredients. It uses wine, but as I always say, you don’t need the expensive stuff. Buy the cheap one and it keeps in the fridge forever (it’s for cooking!). This super easy to make recipe provides almost 50g of protein per serving, 1g of carbs and 630kcal. What an amazing way to cut weight, if you ask me! This goes great with a salad made of fresh lettuce, fennel, arugula, celery, and a couple of cherry tomatoes. With, it goes without saying, some tasty extra virgin olive oil drizzled on top. You don’t need to be a bodybuilder to appreciate this keto recipe. Given the high-protein content, though, this recipe is indicated for whoever does resistance training which means lifting weights. Also if you do calisthenics or gymnastic and you are on a ketogenic diet, this recipe is good for you too! Besides being keto friendly, this recipe is also suited for the following diets: Paleo, Primal, LCHF. You can replace the wine with beer, vinegar, chicken broth. Without further ado, here’s the recipe! Potatoes…who doesn’t love them, am I right?! What if I told you that there is a vegetable that tastes and “behaves” 90% like a potato but with half of the calories? Let me introduce you to a new staple in your diet which makes for a great food hack. Yeah, bizarre name. But you might also know it as neep or swede. I stumbled upon it almost by chance, really. I live in the Netherlands and my Dutch is very bad. I asked for “Kohlrabi” and the fruit seller packed me a rutabaga. Which I discovered only when getting home and finding this HUGE and weird looking vegetable in my bag. I found a lot of delicious recipes on the internet but I didn’t have much time to do fancy stuff so I decided to treat it like I would normally treat a potato and use it to make this chicken stew you can see here. The difference is incredibly subtle. The rutabaga/neep/swede has ONLY 36 kcal/100g!! It also provides a mere 8g of carbohydrates of which 3g are fibers. If you are on a ketogenic diet and miss potatoes, this can be for you! Also for those of you cutting and missing potatoes, try to have some rutabaga! I am going to show you more recipes in the future that are great for cutting! I decided to make a very quick chicken stew using “kipkluifjes”. I have no idea what’s the English word for that and the closest approximation is chicken thighs though they are very small. Of course, you can use bigger chicken thighs, drumsticks, and even chicken breast. This high-protein recipe is a healthy bodybuilding meal great for dinner or post-workout. At 850 kcal this recipe can be a bulking one for those looking to increase muscle mass. If you are cutting, use chicken breast or remove the skin from the chicken. This recipe is also high in protein since it provides 54g per serving. With 32g of net carbs, this can a good post-workout recipe for people on the targeted ketogenic diet (TKD). If you don’t want to use beer, use wine, vinegar, or chicken broth to make this recipe paleo/primal. Have you ever heard of Bud Spencer and Terence Hill? They are famous Italian actors, famous for action-comedy movies such as “They Call Me Trinity”. In this movie, there is an epic scene of almost 3 minutes in which the main character is eating a delicious beans course straight from the pan. The scene is so well done that you start drooling right away. I tried to imagine how that recipe would be like and went about to re-create it. t was as delicious as in the movie. It was as delicious as in the movie it seems to be. This is a healthy, high-protein, low-carb recipe which is great for building muscles! If you want to be as strong as Bud Spencer, you should try this recipe. It’s super easy! This recipe is also gluten-free. How to make a cheap, (fairly) healthy, and high-protein dinner? Well, you use pork, legumes (lentils in this case), and veggies! This recipe is a great high-protein lunch/dinner idea since it packs a lot of proteins and a ton of fibers (for those of you struggling with fiber intake!). It delivers an incredible 38g of fibers per serving. If I remember correctly that’s the recommended intake for an adult male! While being all good for your intestinal health, it’s also very delicious as the aroma of the pork meat perfectly combines with the texture and taste of lentils and tomato sauce. Then, the added spices add a touch of unexpected flavor that blends delightfully with the whole dish. It’s not a quick recipe (it might require up to 50 min), mind you, since you have to cook the lentils but if you have a slow cooker than it’s perfect! Since this is a high-calories recipe, it’s ideal if you struggle to gain weight and muscle mass. This recipe is good also for people on the slow-carb diet! The amount of carbs in the label is net carbs (as in European nutrition labels’ style). My plan was to cook this, wait 1 hour and then have dinner. The taste was so delicious, I ended up eating the whole thing after the first “tryout” bite. In my mouth, there was a mixing of textures and flavors that left me truly surprised and in that ecstasy that only certain food can give you. The crunchiness of the roasted pumpkin perfectly matched with the creaminess of the rice. The richness of the pork sausage masterfully combined with the smoky fresh flavors of paprika and rosemary. This recipe is a keeper. It will always be in my repertoire from now on. This bodybuilding recipe is high in protein and high in calories and gluten-free (great if you are coeliac!). It’s a perfect bulking meal idea when you don’t have to watch too much at your calories. I use it as post-workout since it gives you carbs, protein, and fat in a good ratio. Feel free to change the amounts used to fit your macros.